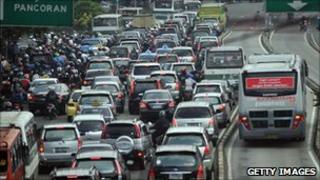 Drivers in the Indonesian capital Jakarta will face higher taxes in the new year if they own more than one vehicle. City authorities are imposing higher taxes in a bid to reduce traffic jams. A driver's first car or motorbike will still be taxed at 1.5% but the fee will rise for every subsequent vehicle. The number of vehicles in the Jakarta area has tripled to 9.5m in the last decade, according to the Indonesian Transport Society. "We hope the higher taxes will reduce traffic congestion as the number of vehicle users in Jakarta is already high," Jakarta city administration spokesman Cucu Ahmad Kurnia told AFP news agency. "Hopefully, more people will use public transportation," he said. Jakarta has an ageing bus network and no subway system for a population of at least 9m people, although plans for underground rail and monorail are being discussed. Campaigners have urged the Jakarta government to invest more in public transport. The worsening traffic situation is one of the reasons the government has recently been considering moving the capital elsewhere.